I'm always really disappointed when folks cite Drew Goddard's Cabin in the Woods as an influence. For me, the best part of that movie was its meta-narrative; it played with structure and convention of a specific genre to ultimately tell a story about the relationship between art and audience. That it also doubled as a delightful horror/comedy (my all-time favorite genre!) was a welcome bonus. Nobody ever seems to pull from that, instead homaging the game's admittedly memorable swerve. Dave Oshry, producer for New Blood Games, pitched Dusk as "Cabin in the Woods meets Quake." I asked him if the Cabin in the Woods influence meant Dusk would be a thoughtful shooter with plenty of gore; a retro shooter with a theme. "No," he responded, and my heart sank. The game is only like Cabin in the Woods in that you start the game killing rednecks and end the game fighting the Old Gods, with a military base in between. I spent most of my time with Dusk with the "killing rednecks" part, and this is where I start praising Dusk for what it is rather than what it isn't. Dusk is not scary. It has moments of tension, but the game's horror trappings are just that. All the masked hoodlums in the world can't stand up to shotguns akimbo. Instead, the game felt like an under-utilized horror subversion -- the protagonist finally starting to fight back against the horrors. It somehow manages to be self-aware without being obnoxious, containing its genre awareness to mechanics and letting the player make their own subversion. My demo began in media res, almost evoking the opening of the Super Hot demo. 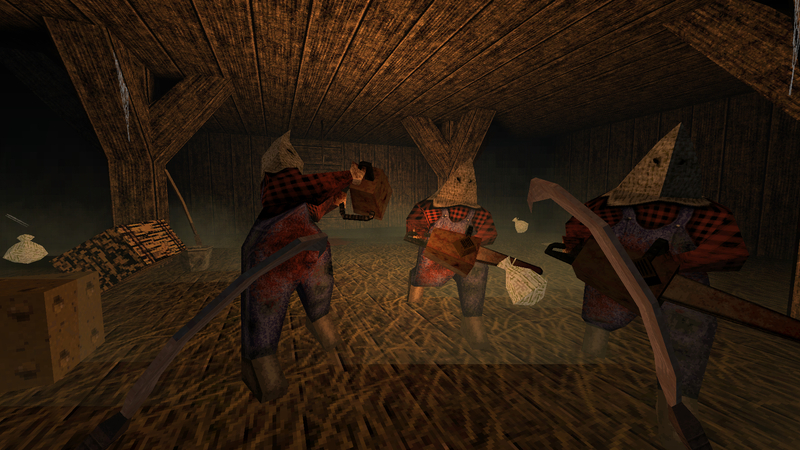 Here, you're cornered by some Resident Evil 4-esque murderers wielding chainsaws. Your only recourse is to pick up those dual sickles and just go to work on those fools. It's not all farming equipment all the time, eventually you get flashier weaponry exclusively for some fool workin'. I was able to mess with the game's arsenal thanks to some well-placed cheats, and I'm happy to report that each gun felt great. It's not just the kickback or the sound effects that make Dusk's weaponry so satisfying, it's the way enemies react. I measure every shooter on the strength of its shotgun, and Dusk's shotgun looks like the most painful thing. In a just world, if I shot a couple dudes in front of their buddies and let the game idle for a week, the rest of the game would be depopulated because those guys would've spread the word about the lunatic with the Hell Weapon. The demo I was shown felt more like a box of toys than a video game level. I could interact with just about everything in the level, right down to a flushable toilet. (And by "flushable toilet," I mean "you can put giblets on the top of the toilet and it will flush.") There's also a bevy of graphical options designed to make the game look worse, to better emulate Doom and its contemporaries. 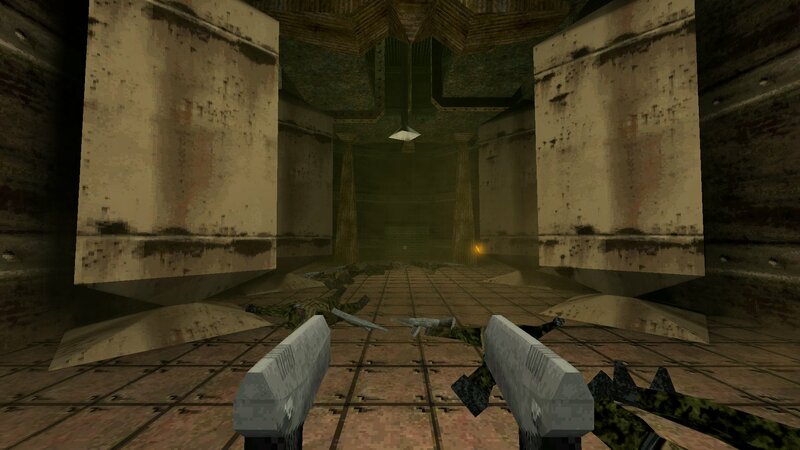 It's also (yet another) retro shooter, so of course there are secrets to find! All these parts made me feel like the game was having a lot of fun with itself and wanted the player to join the party. That's not a bad thing, but it feels at odds with the game's overall attitude; the sum doesn't quite know what the parts are doing. Dusk isn't mind-blowingly awesome -- it's far too cheeky for that -- but it wants to be. That Quake line Oshry fed me never felt completely accurate, no matter how many rockets I blasted at scarecrows. You fight actual Gods at the end of this game, isn't that bodacious? In fairness, there are few other games that feel like the embodiment of a mean-spirited giggle, so I'm not sure how else you would pitch this. Maybe Serious Sam, but even that game has a lot more going on. I liked what Dusk was selling and I'll be curious to see if it can hold its momentum for the campaign's full running time. There's a lot to be said for mechanics reflecting a tone, even more to be said for mechanics that manage to be fun all the while. 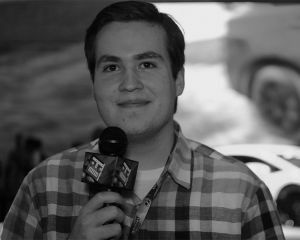 I'm willing to show up and find out for myself if Dusk the final retail product will be as interesting as Dusk the PAX show floor demo. That has to count for something, right?